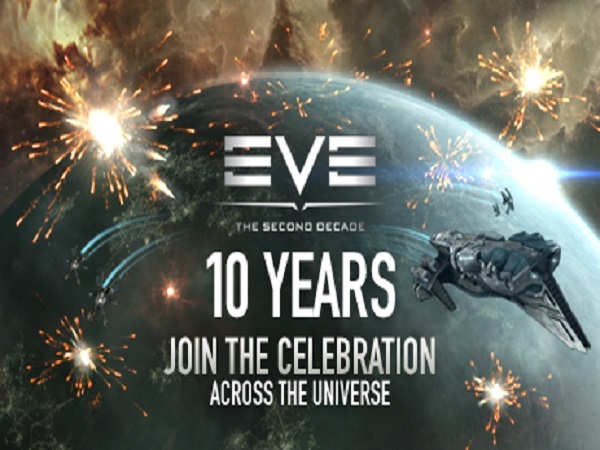 The longest running space MMORPG, EVE Online, celebrated its 10th anniversary on May 6th and broke their record for the most players logged in at one time, with over 65,000. What’s even more unique is that EVE Online only has one active server, which means all of those players are logged into the same universe. There are currently more than 500,000 active subscribers to EVE Online. Crowd Control Productions celebrated the game’s anniversary by holding live events and distributing special fireworks launcher munitions, character implants, avatar clothing and a “Sarum Magnate” frigate. Additionally, all active subscribers received a special battlecruiser, “Gnosis,” in their hangars. Throughout the years players have shaped their own destinies and the future of the EVE Online universe themselves. It’s truly a sandbox experience where players decide their own paths and aren’t required to follow any specific quest line. It also features one of the most difficult learning curves of any MMORPG and a brutal Player-Versus-Player environment as ship and equipment losses in EVE Online are permanent. Not only was there reason to celebrate for EVE Online, but Crowd Control Productions launched their Uprising Expansion to Dust 514, their first-person shooter attached to the EVE Online universe. Improvements noted in Uprising include upgraded graphics, an updated user interface and new gameplay modes, weapons and equipment. Dust 514, and its expansion, are available for download for free on PlayStation Network. The next free expansion for EVE Online, Odyssey, is scheduled to launch on June 4th and will feature a revamped scanning mechanic, new user interface and new rewards for interacting with hidden sites. Odyssey is being designed to increase player interactivity with space and to promote exploration. Tell us, do you play EVE Online and if so, how did you celebrate the anniversary?